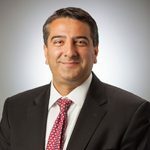 Afshin Safavi is a veteran biochemist with extensive experience establishing and leading bioanalytical teams in pharmaceutical, biotechnology, and manufacturing companies, as well as CROs. He and his teams have supported the development of a broad range of therapeutics in pre-clinical and clinical-trial laboratories. Prior to founding BioAgilytix (NC, USA), he was the Director of Ligand Binding and Immunoassay, operating under GLP at AAIPharma (MA, USA). At Talecris BioTherapeutics (NC, USA), he led the Preclinical and Clinical Assay Development team, building on his experience as a senior scientist at Nobex Corporation (NC, USA), GlaxoSmithKline (Brentford, UK) and IGEN International (MD, USA). Safavi is considered an expert in the area of immunoassays, with a wide working knowledge of various platforms. He obtained his BS in Biochemistry from UCLA (CA, USA), his PhD in Biochemistry from the University of Kentucky’s Medical School (Department of Biochemistry) (KY, USA), and he completed a 2 year postdoctoral assignment at Emory University’s Department of Pathology (GA, USA). There is a lot of confusion in the world of biomarker testing when it comes to the terms ‘assay qualification’ and ‘assay validation’. These two terms are not strictly defined and are even used interchangeably at times. This confusion stems from the diverse scientific backgrounds and disciplines of those of us working in the biomarker field. Scientists from a manufacturing setting, clinical setting, or research setting have a somewhat different understanding of these two terms. Conversely, there is a clear distinction between ‘qualification’ and ‘validation’ for those working in analytical laboratories dealing with drug manufacturing and product release. For analytical scientists, there is clear guidance on analytical and/or equipment qualification versus analytical and/or equipment validation. ‘Validation’ is generally described as the process of establishing documented evidence that provides a high degree of assurance that a specific process will consistently produce a product meeting its predetermined specifications and quality attributes. ‘Qualification’ is generally defined as the action of proving that any premises (site), system, or item of equipment works correctly and actually leads to the expected results. In the bioanalytical world, where scientists are tackling bioequivalent or pharmacokinetic studies, assay validation is well defined in documents such as ‘Guidance for Industry: Bioanalytical Method Validation’ . Methods described in this and other industry guidance can be considered valid if specific acceptance criteria set in advance are met for accuracy and precision of the quality control samples over the range of the standard curve during the validation study. However, before validation, many labs perform a more limited set of experiments without any preset acceptance criteria to assure the assay is robust and will perform throughout the validation. The results from such tests are also used to prepare a validation protocol before validation; this process is what many of us in the industry call ‘bioanalytical assay qualification’. 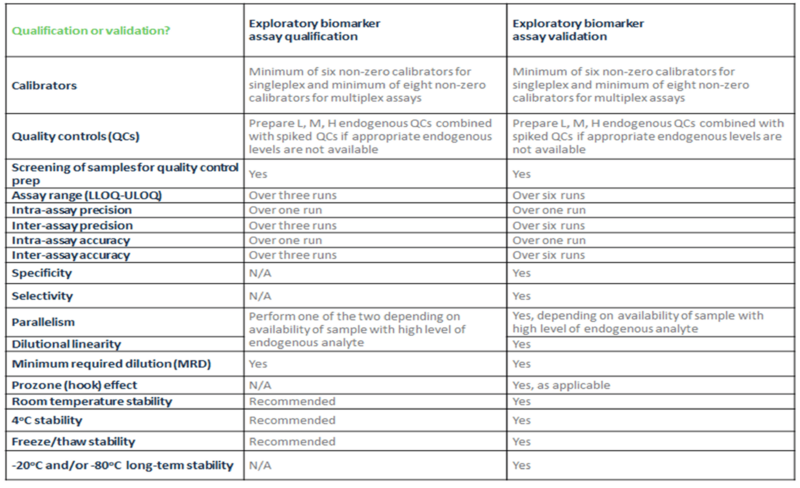 While there is no clear-cut answer as to whether a company should qualify or validate an exploratory biomarker assay before sample testing, it is generally accepted that qualification is a less extensive form of validation. While both the qualification of a biomarker assay and validation of a biomarker assay work to prove that the test is suitable for its intended purpose, they differ regarding the depth and robustness of the parameters evaluated and the number of replicates performed for each parameter. There are companies that take a more conservative approach and perform full validation of the biomarkers in support of Phase I sample analysis. There are others that for cost- and time-saving purposes tend to qualify biomarker assays in research and pre-clinical development, and sometimes even in support of early Phase I and II clinical trials. However, where many companies fall short is in the transition from using a qualified assay to using a validated assay as they move toward the latter stages of the drug development process. The question remains: when precisely should that transition take place? Unfortunately, in the biomarker field this is not an easy answer. To make the best decision it is crucial to continually revisit questions such as: what is the context of use for the assay? What do I want to use the data for? What type of conclusions am I hoping to achieve based on the assay? Is the data I am generating qualitative or quantitative? Am I going to at some point use the biomarker data for regulatory submission, or is it for me to better understand the mechanism of action of my drug? The basic premise of biomarker assay development is to construct an assay that adequately meets the goals of the investigation. In turn, the term ‘fit-for-purpose’ (FFP) is being used more often. Properly defined, fit-for-purpose is ‘‘a conclusion that the level of validation associated with a medical product development tool [assay] is sufficient to support its context of use’’ . In addition to FFP, we need to add the concept of the ‘context of use’ (COU), which addresses the context in which data from the assay will be used and helps to further define the fit-for-purpose expectations for the biomarker assay validation. Applying COU and FFP concepts prior to starting the study, in conjunction with their company’s level of risk/comfort level, should help scientists in deciding whether to qualify or validate a biomarker assay. BioAgilytix has worked in the exploratory biomarker world for nearly a decade now, supporting thousands of complex biomarker studies. Our expert scientific team has created and utilizes a general template that summarizes which parameters and the minimum number of replicates to be included for biomarker assay qualification versus biomarker assay validation. You can see this template laid out in the table below. We have found that this table provides an excellent place to begin your decision-making. By learning from the client the COU and FFP of the assay, we can decide whether to qualify or validate the assay as well as determine which assay parameters to include in the study. When it comes to deciding whether to qualify or validate an exploratory biomarker, let the concepts of COU and FFP drive the direction as to which assay parameters you need to include in your study, and whether to qualify or validate the assay before use. US Department of Health and Human Services. Food and Drug Administration. Center for Drug Evaluation and Research (CDER). Center for Veterinary Medicine (CVM). Guidance for Industry: Bioanalytical Method Validation. (2001). FDA-NIH Biomarker Working Group. BEST (Biomarkers, EndpointS, and other Tools) Resource [Internet]. Silver Spring (MD): Food and Drug Administration (US). Glossary. (2016) [Updated 2017].